Publishers have long used print anthologies to introduce new authors to a wider range of readers who may buy the book because of the popular lead author on the cover. You’ve probably seen many such anthologies on the bookshelves….an extra thick book, which includes three or four full length novels, or perhaps the works are in a shorter format, such as novellas. Being part of an anthology is a lovely opportunity to reach new readers–who will hopefully become ongoing fans. Do you enjoy reading this type of book? Have you ever read an anthology and discovered great new authors that you loved? Did you then hunt down their backlist, or watch for their upcoming releases? Can you remember any such authors in particular? I’ve been in a number of these series, for both Superromance (in my old secular days) and later, for Love Inspired Suspense. It can be such fun to work with the other authors and get to know them better. It can also be a challenge to work out all of the plot, setting, and character details from one author’s book to the next, though. Literally hundreds of emails flew back and forth between the authors on the last six-author series I did. In recent years, with e-readers and indie publishing becoming so popular, another type of group effort was born: the indie anthology. Around four years ago these were really catching on, and now the number of titles has truly proliferated. You can find them on just about any topic you can imagine. Though these may be called “boxed sets” they are generally in e-book, not in a physical form–especially if a large number of authors contributed. Below, you can see just such a cover. They do look like a boxed set, don’t they? Have you seen these anthologies for sale on Amazon, Nook, Barnes & Noble and other websites? Have you ever bought one? What did you think? I’ve been involved in three such indie, e-book anthologies (Sweet Christmas Kisses ) published by the Sweet Romance Reads” group, including the Vol III release for 2016 which includes seventeen authors and comes out the end of this month. This year, our SCK III has a pre-order price of just 99 cents. Just to give you an idea about why we’ve never considered offering them in print form, the first one (2014) would have been over 1,600 pages long. Imagine trying to read that in bed! It seems as if there are a thousand details to work out before such an anthology is finished, and usually some promotion efforts as well…because there are certainly a lot of other fish in the pond vying for attention. So a good group of hard-working authors is essential. The end result, though, is an opportunity for readers to meet a LOT of different authors with a single (and usually very inexpensive) purchase of the many boxed sets available. This format seems to be popular. The first two Sweet Christmas Kisses anthologies spent a total of five weeks on the USA Today Bestseller list amongst all the novels in every genre (three weeks for the first one, two weeks for the second), which was sooo exciting! I know some of the other authors here on Inspyromance have participated in these e-book anthologies, also. So…have you ever purchased an e-book multi-author anthology? What did you think? Did you find any new favorite authors? Did you feel as if got a good bargain for your money? I’d love to hear what you think about this new wave in publishing! 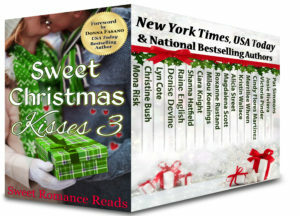 Those who comment here will be in a drawing for the THREE copies of Sweet Christmas Kisses III that I’ll be giving away. and will send each winners a copy after the 9/27/16 release date. Just so you know, this SCK III anthology contains novellas by sweet romance authors, and also some by inspirational authors–so it is all a “good clean read” but just some of the novellas have an inspirational thread. Thank you for the detailed explanation of boxed sets, Roxanne. Personally, I love them. They are typically a good bargain, but what I like most is discovering new authors. I feel just the same, Jill! I am always keeping an eye out for new ones. I love box sets! Good value for money and also quick reads when you don’t have a lot of time. Great explanation on boxed sets, an excellent way to read new authors. It was through a boxed set that I was introduced to the authors at Inspy Romance. Being newly retired and on a fixed income, the box set was a bargain price for 8 or 12 books by new authors. Now these authors are my friends and I am are their review teams. My favorite box sets are around a holiday theme and / or animals. Pre-ordered Sweet Christmas Kisses 3. Ooooh yes— I love the holiday theme and animal themed boxed sets, too! In almost all of the books I write, animals play a part in some way, And you are so right–what a bargain they are. How lovely to hear that you are now so involved. It’s really special to find readers willing to read and review novels. I am always looking for people willing to do that! I love box sets. Usually because I can get books from my favorite authors at a really good price but also so I can learn about new authors. I love buying the boxed sets too. What a great opportunity to find new authors to read! I have enjoyed the Love Inspired & Love Suspense Series by a select group of authors for years now. I am always amazed how well the authors blend the stories together. Once I received my kindle I found the box sets and have purchased several of those. I love anthologies for all the reasons you stated. I enjoy the anthologies, although laugh to myself at boxed sets in e book form. Where is the box? I love my e reader though, and read in bed sometimes, so holding 1600 pages would be tough :-). I love the price, it is something I can afford. I have met many new authors that way. I appreciate the work that the authors put into the writing. Thank you!!! Yes–the number of pages, if the anthologies were in print, are mind boggling. On this new 2016 anthology, my novella starts around “page” 1,450 or so! So glad to hear that you have found new authors, and have then followed their other works! Box set are fun because we get to read many different authors and maybe read new ones we’ve never seen. Fun fun! I agree totally. It’s great to find new authors to read! Box sets are great for readers, and they’re great for authors, too. I’ve read many and participated in several. Quite a few readers “follow the authors home” and purchase other books by them – books they might never have noticed otherwise. As far as I’m concerned, box sets are win/win! I’ve bought several boxed sets, and have found new authors that way. Love the pricing too! I love box sets. Not only are they a great value, but I have found several new go-to authors when reading these sets. it is a nice way to get a feel for an author’s writing style to see if it matches your personal taste. Exactly. And isn’t amazing how author voice can vary, as well as the story telling style? So these boxed sets are really a great opportunity to sample many authors, via an inexpensive format! Wonderful to hear that you review books. You are doing a good service for readers, and authors appreciate it very much. It’s great to see that so many blog visitors do enjoy the boxed sets. I too like the similar themes! Especially the ones with holiday themes. I guess they make me feel happy and festive, when the holidays are around the corner! As a reader, I’ve had mixed experiences with boxed sets. The first one I bought had (I think) 6 books, and the stories were all good to excellent. The last one I bought because I REALLY wanted the new novel from one author, and this was the only way to get it. But of the 12 books, I only managed to finish 7, and 4 of those were best described as average. It certainly didn’t introduce me to any new authors – the 3 stories I enjoyed most were from authors I already knew about. Sorry you haven’t had good luck. Win some, lose some, I guess! I don’t always like every story in the boxed sets I have purchased, but the sets are usually sold at such a reasonable price that I still figure its a great way to discover a good author I might want to search out later on. And happily, I have found some really top notch authors that way. Honestly I have bought a bunch esp when they were free ones but so far I have not been impressed with the ones I read. They are more like emergency out of books to read back ups on my Kindle now days. I am just not a big fan of novellas and feel kind of cheated by the brief story. Then most of the ones I have read were poorly formatted or horribly written sometimes both. So now only buy if it has an author I know I like and even then they often times don’t end up high on my TBR list unless it is an author I LOVE. Second try–my first reply disappeared. If two eventually appear here, my apologies. Sounds like you are a discerning reader and like so many of us, don’t have a lot of extra time for poorly produced books. Sorry to hear you’ve run into them, but glad to hear that you have authors you love! I love boxed sets..great way to read new authors….thanks for the giveaway! Good luck with the give away!